5. Turn LEFT to Sedeño (Apartment 1B should be on your right side before the next street corner). The first floor of Apartment 1B looked like a well lit fine dining restaurant, classy and private. When we got to our table on the second floor, we were amazed at the changed in atmosphere, it actually felt like we were fine dining in a Chinese restaurant! The place looked real homey and comfortable. The wait staff were very courteous and knowledgeable of the menu to boot. According to Click the City Apartment 1B serves French cuisine but it seemed more like a fusion of American, Italian, Spanish and French cuisines with a touch of Mexican mixed-in. We think that's what makes it Gourmet Comfort Food. We started with a bowl of Corn Chowder (Php170) with herbed croutons. 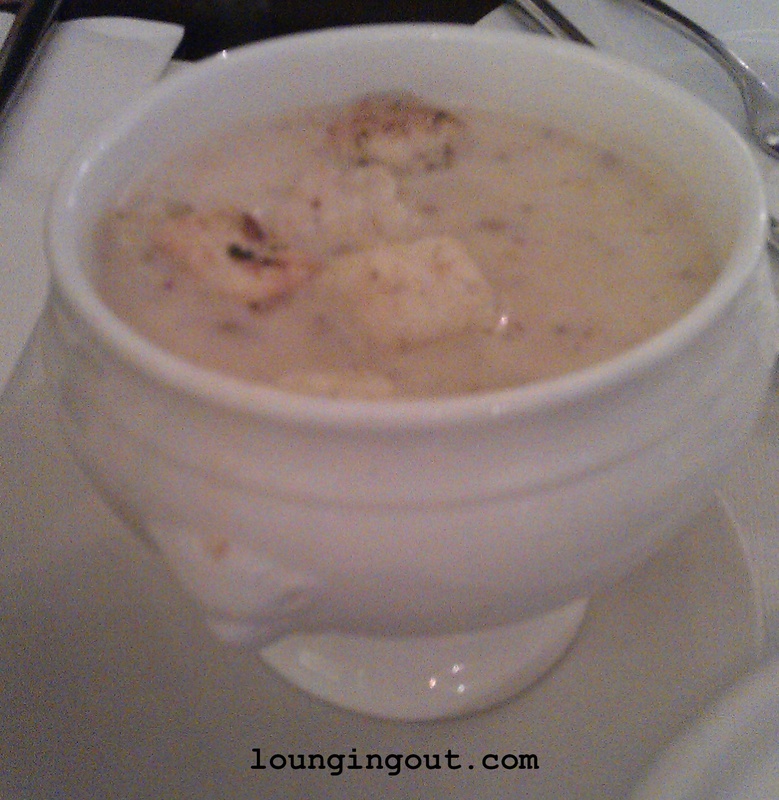 The chowder tasted good and the serving, supposedly for one, was actually good for two. It was also served in a lion crested bowl/cup which gives it a “not your usual” chowder look. 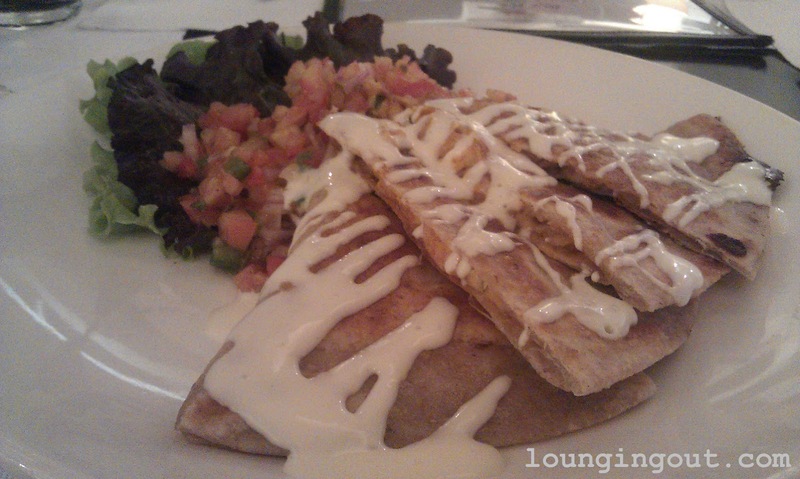 We followed the chowder with a plate of Chicken Quesadilla (Php290) with tomato salsa. 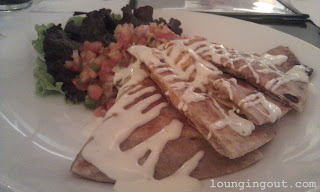 The quesadilla was great by itself and the tomato salsa provides a good accent to the taste. 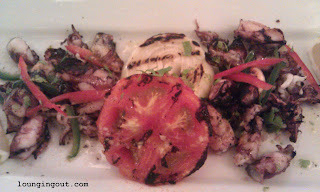 We also tried the new addition to Apartment 1B’s menu, Grilled Baby Squid, which was recommended by the wait staff. The baby squids were grilled just right and were very tender and it tasted good too! If you plan on dining here, this is a must try. Since we like to experiment with our beverage, we asked the wait staff for a recommendation. We wanted to sample their Apartment 1B’s special beverages, if any, and when we heard that the wait staff say Fresh Mint and Green Apple Shake (Php150) we were intrigued and we all ended up ordering it! 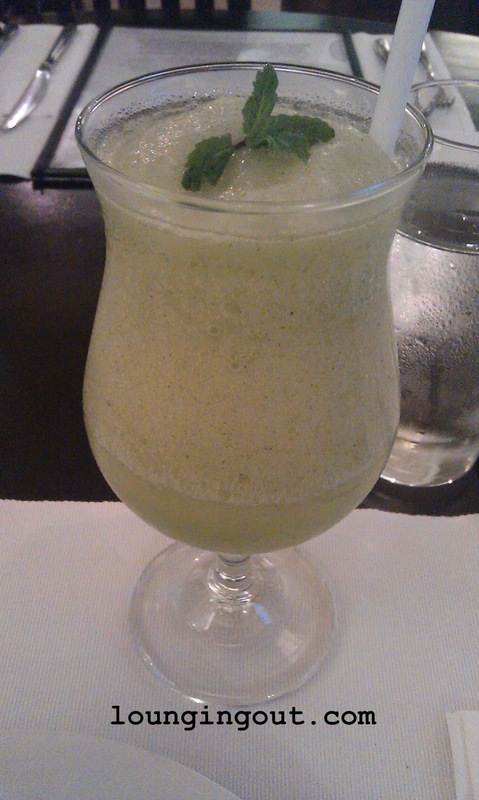 We have to say we were anxious about what the taste of green apple and mint mixed together would taste like, and fortunately for us, it tasted great. We were having a great time with the starters so we decided to order Crabcakes (Php250) before we order the main courses. 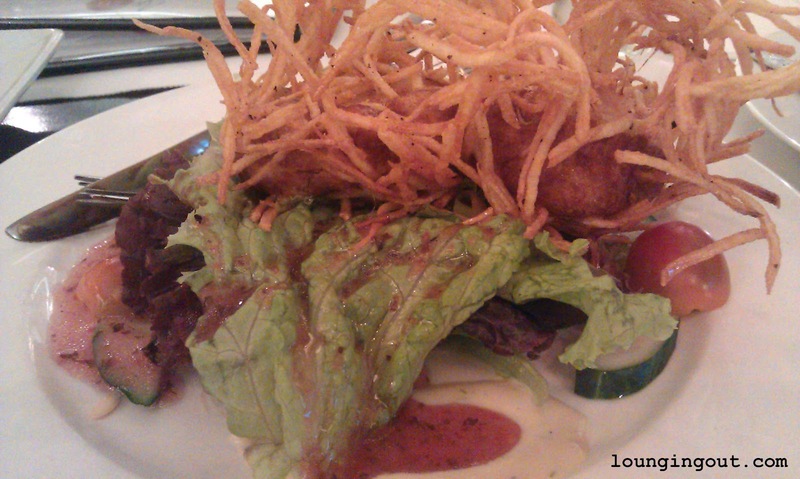 We were not disappointed with the crabcakes. The pieces were made of fresh crabmeat and apart from the minimal breading/batter it had no noticeable extenders. Our first entrée was Grilled Prawns (Php730) topped with crab-fat and was served with mixed vegetables and lemon pasta. We thoroughly enjoyed this dish! The lemon pasta was mildly spicy with a hint of lemon. 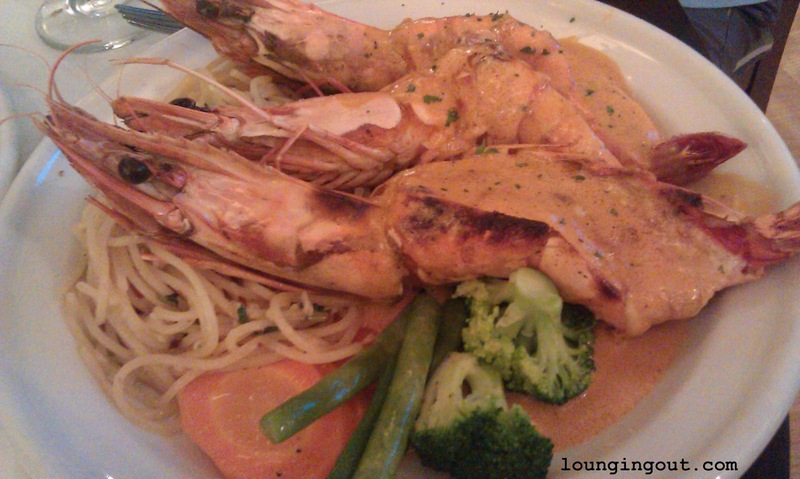 But what made this dish amazing are the grilled prawns and the crab-fat sauce. Well the wait staff did say the prawns were large, but we didn’t think it’d be this big! The three large prawns were perfectly grilled, keeping the prawn meat tender and juicy and the crab-fat sauce just takes this dish to another level. Another must try. We decided to ask Apartment 1B’s wait staff for popular dishes even as we ran through the menu since we had no idea what to choose for our second entrée! 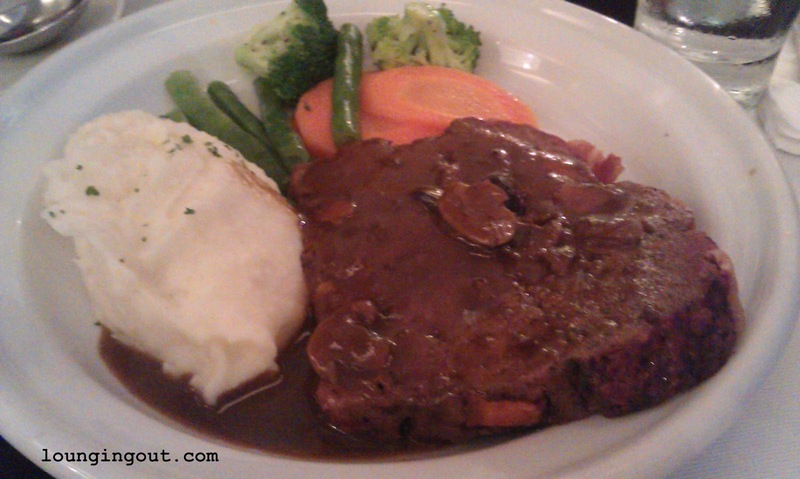 The wait staff recommended Meatloaf (Php340), at first we though the wait staff was joking. Really, meatloaf in this restaurant? But since the wait staff looked serious we decided to look t up in the menu and saw a Meatloaf priced at Php340. When we asked the wait staff how many slices was on order, we courteously informed that it was one very big slice. We thought that 340 bucks for a slice of meatloaf is a little pricey. We wandered off it at first but ended up ordering it nevertheless. Our curiosity got the better of us, we thought. When the meatloaf was served, we realized the wait staff was not kidding when he said it was a very big slice! The meatloaf did not taste nor had the texture of meatloaf at all, it had the texture of really tender steak and tasted like one too! The mushroom gravy and the mashed potato served with the dish complement the meatloaf well. This time our curiosity paid off. 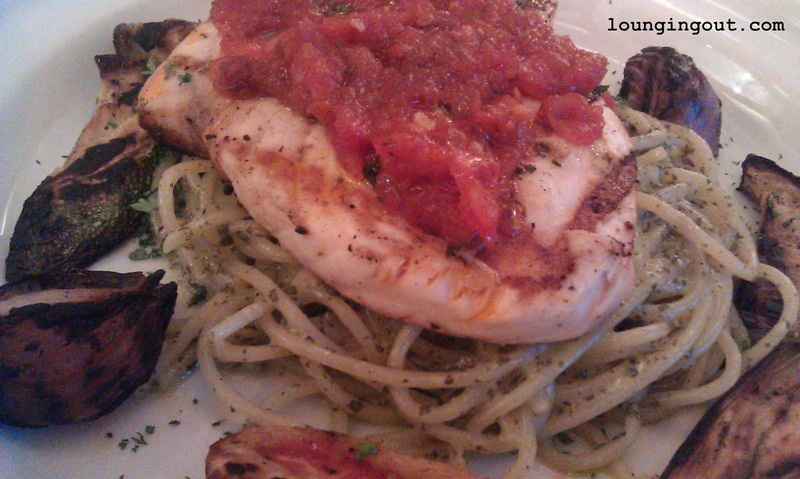 We also tried Apartment 1B’s Grilled Blue Marlin (Php500) topped with chorizo tomato relish and was served with pesto pasta. Like the prawns, the marlin was perfectly grilled. It retained its freshness and tenderness and was not dry. The chorizo tomato relish was an excellent accent to the marlin. The pesto pasta not bad, but compared to all the dishes we sampled, it tasted ordinary. 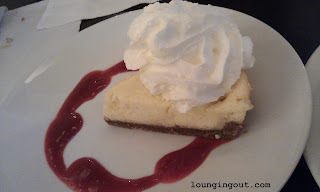 For dessert we tried Apartment 1B’s White Toblerone Cheesecake (Php180) served with raspberry coulis. We think the raspberry coulis was good for the presentation, but it did not add to nor complement the flavor of the cheesecake. Still, we enjoyed the cheesecake! 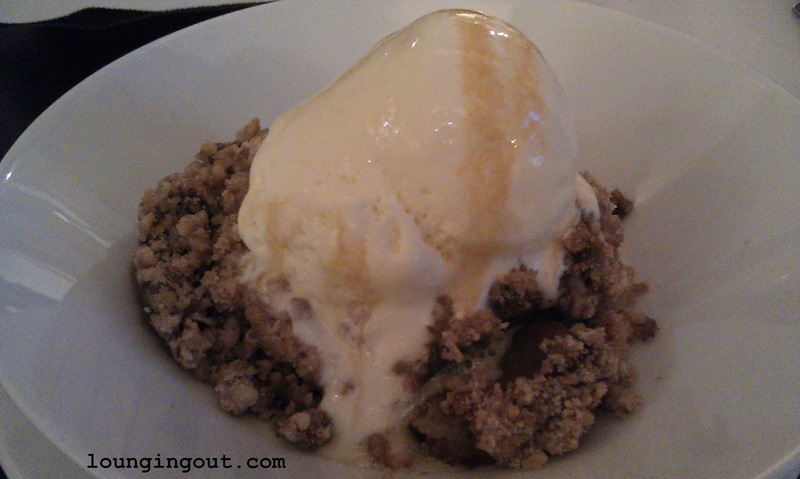 We also decided to try Apartment 1B’s Apple Crisp (Php190) served with vanilla ice cream and caramel syrup. If you like apple pie and ice cream, you’ll love this dessert. The apple crisp was served warm and the melting vanilla ice cream complemented its taste. 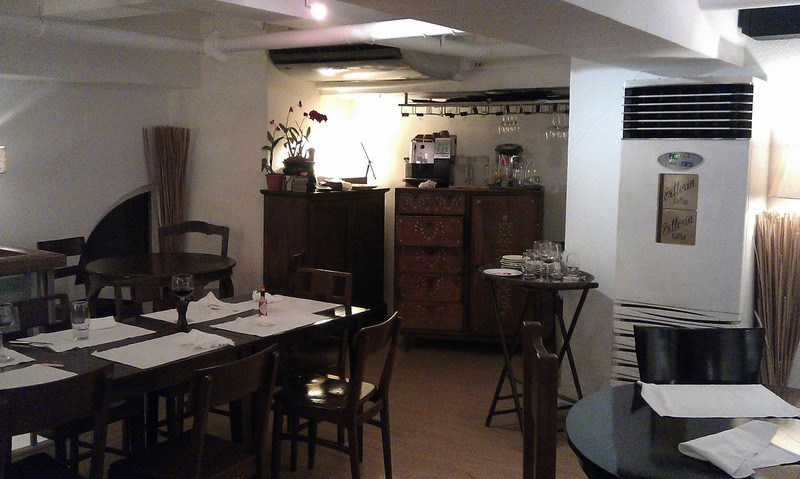 A budget of Php500-Php1000 should be adequate to try some of Apartment 1B’s dishes. To check out more of the menu, you can get it here. Note: Prices Inclusive of 12% VAT. You will be charged an additional 10% for Service Charge. 7: We haven’t enjoyed a new restaurant as much as we have Apartment 1B in quite a while. It seems that you will never go wrong with anything you order! The wait staff are courteous and knowledgeable of the menu. The place is cozy and comfortable. Before leaving we were already checking out Apartment 1B’s menu for some other dishes we might be trying on our next visit! Even though the food is a little pricey, we believe it is commensurate to the value of the dish and the experience. A must try.